Cadet Andrew Peterson toasts the audience during the Grog Ceremony. FAYETTEVILLE, Ark. 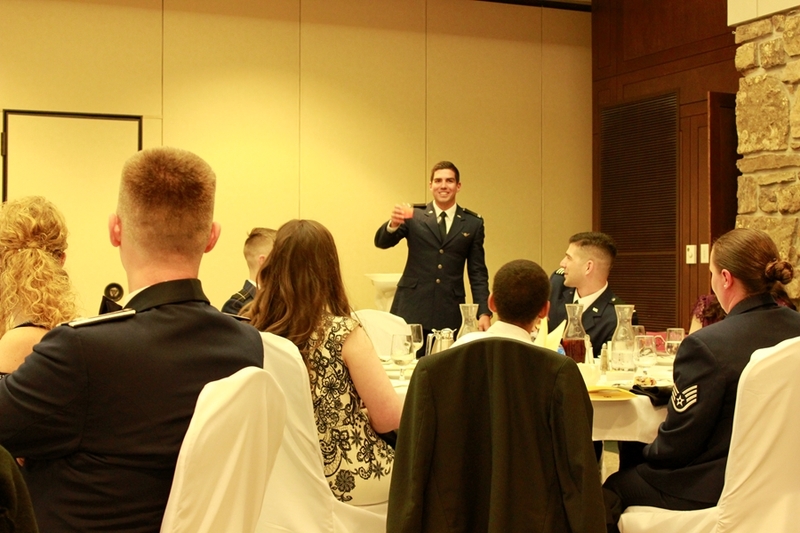 – The University of Arkansas' Air Force ROTC Detachment 030 held its annual Dining Out on April 21 at the Janelle Y. Hembree Alumni House. Total attendance was 83, comprised of cadets, cadre, and guests. The guest speaker was Major Jordan L. Tharel, assistant chief of current operations for the 188th Operations Support Squadron based in Fort Smith. Tharel is a 2006 graduate of the University of Arkansas and a pilot with over 1,000 combat hours. The Dining Out is a time-honored military tradition designed to teach cadets proper customs and courtesies in a formal setting and to promote camaraderie through a night of humorous entertainment. The cadets learned about traditions such as the Rules of the Mess and the Grog Ceremony. At the conclusion of dinner, the cadets capped off the night with music and dancing.